This article describes common mistakes and misunderstandings about cleaning or pumping the septic tank. We explain why pumping too infrequently (or never) is a bad idea but we add that pumping more often than necessary is more or less tossing money down the toilet. We also explain why a septic tank is normally always "full" and that after pumping the septic fills up pretty quickly in normal use. The article also describes effective vs. ineffective septic tank pumping and how you can improve the septic tank cleaning procedure so that pumping the tank is actually useful. Finally we note immediate & serious safety hazards that should be addressed when cleaning septic systems. Pumping or cleaning the septic tank too frequently, wasting money (though you're wasting a lot less money than the cost of a new drainfield. Some septic pumping contractors and some other "experts" give a fixed rule of thumb that gives advice that is safe and profitable such as "pump your septic tank every year" or "pump your septic tank every two years". This advice is safe but except for unusual circumstances it is wrong. Contractors may give this advice without first having actually considered any information about the actual septic system capacity, size, level of usage, age, or other conditions. The OPM Problem: It's a great example of "OPM" or "other people's money" - spending someone else's money to reduce your risk that they'll complain that your advice wasn't safe enough. In a failing septic system case in Minnesota, the contractor assured that "things will be fine if you just pump the septic tank every couple of months or after you've had a lot of visitors". The theory is that you pump the septic tank the septic tank after heavy usage to "get back to normal". It might be smarter to pump the septic tank before or both before and after heavy use when we know a septic system is marginal. But this can be pretty expensive. Using a hired port-a-john might be much less expensive and might help avoid a sewage backup. See SEPTIC BACKUP PREVENTION for tips to avoid a septic problem during times of anticipated heavy septic system usage. Pumping the septic tank to "fix" a clogged or failing drainfield. All you really gain is a few days of toilet flushing before the tank has re-filled, or at most weeks of respite. More frequent pumping of the septic tank amounts to treating the septic system (tank and disposal fields) as a septic holding tank system instead - a costly proposition that may be necessary in some emergencies but not an attractive solution to onsite wastewater disposal. More about this snafu is provided below. Pumping the septic tank before a septic system inspection or test.the purpose of this tank pump-out is to hopefully prevent the inspector from finding evidence of a failed drainfield. An empty septic tank prevents the test-inspector from pushing any effluent into the drainfield. See WHEN NOT TO PUMP A SEPTIC TANK. If you're normal you don't have fantasies about septic tanks. OK let's call these "septic tank misconceptions" that are worth clearing-up both to save money and to care for the system effectively. A septic tank in normal use is always full, right up to the bottom of the outlet pipe (near the top of the tank). After pumping it out completely, an empty septic tank fills up again under normal usage in just a few days, after which it is again discharging liquid effluent to the absorption field, soakaway bed or leach field - names vary by country. In a normally-working conventional septic tank we find wastewater, or "blackwater": a combination of watery sewage effluent, a floating scum layer at the tank top (in Austraila the "scum blanket", and settled sludge in the bottom of the tank. 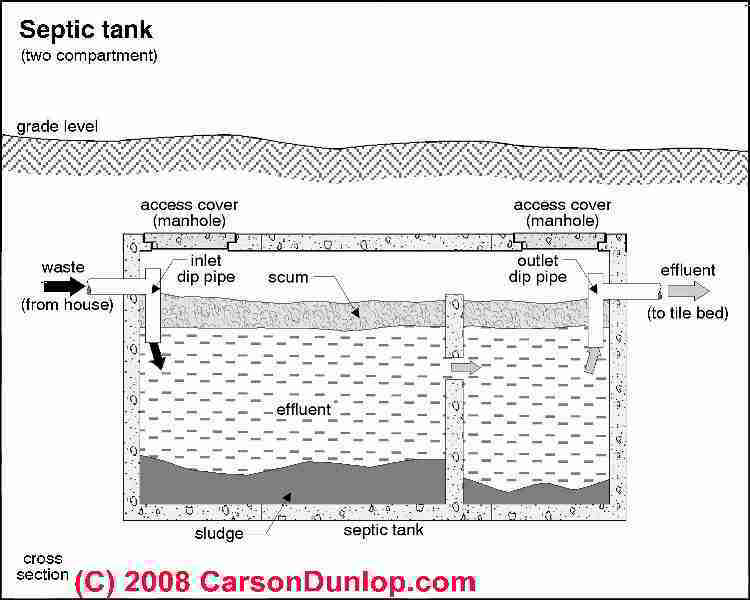 If as in the sketch above we could see a cross section of the septic tank contents (if we wanted to) we would know when pumping the septic tank is actually necessary based on its sludge and scum layers - that is, based on data instead of either theory or wild arm-waving. the EFFLUENT RETENTION TIME, the time that wastewater has in the tank to allow for solids and floating scum to separate from effluent being discharged to the drainfield (soakaway in the U.K.) is too short. This gives new meaning to time is short, right? Short septic tank effluent retention time means we're pushing solids into the drainfield, clogging it up & shortening its remaining life. the SEPTIC TANK PUMPING SCHEDULE or using objective data obtained by actually inspecting the septic system, diagnosing any problems or failures, and inspecting conditions inside the septic tank. SEPTIC TANK OBJECTIVE DATA we explain how a septic contractor can measure the scum and sludge layers. That's a step that's sometimes worth the trouble and that might be taken the next time you have the septic tank pumped. can MEASURE SCUM & SLUDGE. see SEPTIC TANK LEVELS of SEWAGE. Finally, sometimes extra septic tank pump-outs are useful - something that we will discuss below. In a conventional and most other septic system designs not only do additives, chemicals and treatments do little or no good, some can damage the system, causing frothing, causing solids to be discharged to the drainfield. No expert recommends the use of septic treatments or additives, and these substances are illegal to use in many jurisdictions in the U.S. and Canada, at least in part because some of them are also toxic and are environmental contaminants. Details are at CHEMICALS & TREATMENTS for SEPTICS. Septic tank fantasy No 3: some septic systems never need to be cleaned, pumped, serviced. Nope. As my Mom used to day, in your dreams, buster. The septic tank shown at left was totally packed with solids and was collapsing - it had not been pumped in decades. The home, occupied by a single elderly person, limped along until new owners bought the property and tried taking a couple of showers. It is true that the required septic cleanout frequency varies not only by tank size, wastewater volume being produced, and system design, and some systems require less frequent cleaning for the same usage level compared to other designs, but all septic systems need periodic maintenance. Failure to properly maintain the septic system is the No. 1 cause of early septic system failures. Unfortunately, a drainfield or soakaway bed that is in failure would require an estimated 5-10 years of total rest to "recover" enough to be restored to normal use. Even then the field won't work if it's flooded or if the field has been damaged by vehicle traffic, tree roots or similar troubles. What you actually get by extra septic tank pump outs in an area of failed drainfield is a few days (less than a month) of toilet flushing and wastewater disposal into the septic tank until it fills up again and is again trying desperately to push septic wastewater effluent out into the soakaway bed. Even using a fantastically small number of 50 gallons per person per day in a home where extreme water conservation measures are in effect or where there is a single elderly occupant using very little water, the septic tank still fills up quickly - typically in as few as 1-2 days, or at most in about 20 days of use. Resting a failing or failed drainfield for 20 days doesn't fix anything. Wow what a mistake this is. At left I show sewage effluent running down a hill over rock. That straw-covered pile in the top of the photo was covering the septic tank that the property seller had asked her septic contractor to pump out just a few days before my inspection. That the system was in total failure was evident after just two days of household use of the septic system. The tank had re-filled in that time, then sent effluent to the property surface. To be of any use at all, when pumping the septic tank we need to remove the settled sludge and floating scum from the septic tank, not just the liquid effluent. If the septic contractor just pokes that septic tank pumping hose down into the middle of the tank and just pumps like mad all she's doing is removing the effluent. The sludge stays on the tank bottom - or most of it does - and the floating scum falls down to rest nicely atop the sludge layer. What is our septic tank pumping contractor doing with that pole in his right hand while he manuipulates the pumper truck hose with his left? He's using long-handle hoe-like tool to scrape and stir up the dense sludge on the septic tank bottom, mixing in a bit of liqui so that the vacuum hose can pull the sludge out of the septic tank. Your guy doesn't do this? Interesting. - Just Say NO! Tell 'em not to let the door hit their backside while they're on the way out. You need to find a different septic pumping service. The We Pump it & then We Put it Back septic pumping company is simply saving themselves the cost of disposing of sewage from their truck, they're not doing anything to help your septic tank nor system and they're speeding the demise of the absorption field. An effective septic tank cleanout removes the scum and sludge by moving the pumping hose around and by using the liquid effluent to help break up and pump out the solids. If the pumper just tackles the easy task of pumping out the liquid effluent itself he's not performing a useful job. Just pumping out liquid effluent doesn't benefit the system. In fact, just pumping out effluent and leaving the solids means that after every such unfortunate "mis-service" of the tank the actual remaining tank volume available for wastewater treatment is less and less. Not easily, but it might be possible. In traditional septic tank cleaning operations the operator needs room to manipulate the septic pumper truck hose to remove the floating scum layer and settled sludge layer. Without manipulation space and room to stir sludge and scum with a hoe, rake or other tool, removal of solids is difficult and might be limited. At left we show small-diameter septic tank riser that has been used for years to "pump out" the septic tank at this Minnesota home. at RV HOLDING TANK DUMP INTO SEPTIC TANK?. But how thoroughly do you think the septic tank pumper can clean the septic tank working through just this small-diameter opening to reach a tank located several feet below? Unless we do something extra (see below) it is just about impossible to remove most of these key constituents if all we can do is poke a pumper hose straight down into the septic tank. Jimmy Herring (Herring Sanitation, Poughkeepsie, NY) demonstrated the right way to clean out a septic tank in the photos below. You'll see that Mr. Herring is working through a much larger opening - the septic tank access cover gives enough room to manipulate the pumping hose. Crust Busters provides a motor-driven auger that stirs up the septic tank floating scum and settled scum layers, permitting the septic tank pumper to successfully remove these constituents along with septic effluent. The Crust Buster is a 33-pound motor driven mixing device that combines an 80-inch shaft with folding, hinged mixing bladesthat open out when spinning to break up and make septic tank solids pump-able through a small access port. Depending on the diameter of the septic tank pumping opening the operator selects a 2-blade attachment that can slip thorugh a 4-inch diameter opening, or a 3-blade attachment that is not collapsible and fits through a 12" or larger diameter opening. Crust Buster shaft extensions permit operating the device in deeper septic tanks. - Thanks to septic cleaning contractor Daniel Zeimet, Two Harbors MN, for this tip. You could also fabricate your own septic tank sludge/scum break-up tool or scum and sludge measuring tool. See TOOLS for MEASURING SCUM & SLUDGE. Still, working through a tall, narrow 6" diameter vertical riser, it is difficult if not impossible to inspect the septic tank condition and that of its baffles through such a narrow vertical access opening, even using a traditional flashligt and mirror. If we can't gain visual access to the septic tank interior or visual access by removing covers at the inlet and outlet ports, we won't know the condition of the tank, it baffles, its sludge and scum layers. We also may not know if there are leaks into the septic tank or leaks out of it through damage or poor seals at any of its openings. Without using a larger septic tank access opening we probably won't know if a flooded drainfield is back-flowing into the tank during pumping, and we won't know how much sludge and scum were left in the tank. The photos above show important conditions that you cannot see through an 8" diameter septic tank riser. Technical note: it's possible to to add a large-diameter septic tank riser capped by a vehicle and child-safe cover to make future septic tank servicing more effective. But don't spend on this improvement before knowing that the septic tank itself will continue in use. For example, a rusted-out steel septic tank is going to need complete replacement. It may also be possible to gain improved visual access to an otherwise difficult-to-access septic tank interior using electronic gear including flexible borescopes, lights, and similar remote inspection camera-equipment: all added sophistication, complexity, and costs that may mean these tools are not in the hands of most septic tank pumping companies. Septic tank fantasy No. 7: it's ok to discharge excess septic effluent from the septic tank to the surface, to a nearby drainage ditch, lake, stream, or to your neighbor's yard. In a conventional septic system (tank and soil absorption bed or drainfield) no more than 40% of the wastewater treatment is handled by bacteria in the septic tank. The rest of the wastewater treatment occurs thanks to bacteria in the soil. Discharging such wastewater anywhere out of the treatment system is unsanitary, contaminates the environment, makes your neighbor mad, and is illegal virtually everywhere. You are not even allowed to discharge graywater (washers and sinks) to the surface. An exception is clarified highly-treated wastewater effluent produced by a properly working aerobic septic system and highly-treated wastewater from advanced septic system designs that treat effluent to a level equal to or exceeding the sanitary nature of ordinary ground water or surface water. In these instances discharge of wastewater may be allowed by permit though for some installations a final wastewater disinfection step may still be required. Our photo at left shows heavy algae growth along the shore of a waterway abutting an older home whose septic system was installed in the 1970's. No sewage effluent appears at the surface of the property, toilets flush (though slowly and badly) and drains drain (though sometimes slowly). There are no sewage odors at the property. Even a septic loading and dye test may fail to show a system failure at this home. Because the algae grows only close to this property we suspect that high nitrate discharge from a failed septic system is producing heavy algal growth in this spot. The combination of age, algae, and slow burbling drains is an indicator of the condition of the system though there is no evidence of sewage effluent at the ground surface. This septic system is in technical failure in that it is not properly treating the wastewater it receives. Watch out: A system in this condition is also at high risk of sewage backup into the building. Pumping the septic tank won't alleviate this trouble: days after the tank is pumped effluent will again be discharged into soils that ultimately drain into this waterway. Improvement in the treatment level within the septic tank might help (a conversion to aerobic?) or drainfield reconstruction may be needed. at CLOGGED DRAIN DIAGNOSIS & REPAIR. Pumping the septic tank may give temporary toilet flush improvements but it's not going to repair a clogged drain nor a failing drainfield. Technical note: if an older grandfathered septic drainfield is closer to a body of water than current codes allow, its replacement may need to be relocated to a more distant location. In that event we usually can leave the septic tank in place, adding an effluent pump to move the tank output to the new absorption bed. Septic tank fantasy No. 9: ok so we know the septic system is old and at end of life. It's ok to keep using it, right? Well this fantasy has merit: sort-of. We never want to call a contractor in a panic asking for an emergency repair: the price of the job doubles or worse, not only out of gouging or greed but because the contractor has to shuffle work, put off other customers, and maybe ultimately even lose that deferred business. Conserve water: minimize the running of sinks, showers, tubs. Flush the toilets only when really necessary, not after every pee. Make certain that no plumbing fixtures or equipment are running constantly: running toilets, water softeners stuck in regeneration mode, etc. Don't flush unnecessary food waste, oils, or toilet tissue into the system. Minimizing the solids load on the septic tank makes wastewater treatment a bit easier. Provide septic tank pumping access: If the septic tank pumping access is not readily available, or if the septic riser is too small to prevent actual removal of the solid sludge & scum, when weather & money permit, install a larger septic tank riser so that the tank can actually be properly cleaned. Otherwise pumping what will be mostly just the liquid effluent won't help much. Pump the septic tank, emphasizing the removal the sludge and scum debris, before anticipated heavy usage. It may make some sense to pump the tank after heavy usage too, but pumping it before reduces the chance of a sewage backup into the building during the big event when lots of people are present - the ugliest time for dealing with a backup. Hire a port-a-john before that big family wedding or festival when you're inviting 20 extra people to stay over for a weekend or longer. Actually, experts consider an extra 3 people visiting over a weekend as stressful on a marginal septic system. Check with your homeowners insurance company and if available, add policy coverage that will address a sewage backup into the home. Don't leave precious art-works or valuable carpeting on the home's lowest floors. Redirect surface runoff: when weather, time & money permit, AND if wholesale septic tank or drainfield replacement are NOT going to be done quite soon, spend on directing surface runoff away from the drainfield area. If there is deep groundwater flooding the drainfield you may need to add a curtain drain. Otherwise simple surface contouring may be enough. DO NOT drive equipment over the drainfield. Redirect graywater to reduce the load on an older septic system: adding a separate drywell makes sense for some properties where space and money allow. By reducing the graywater load on the septic drainfield we extend its life and eke out more years before it has to be replaced. See DRYWELL DESIGN & USES. Add a septic or graywater filter: Some designers recommend adding a filter system to an existing building's plumbing system to keep lint out of the septic tank, or if using a drywell, to keep lint out of the drywell - a good idea but I'm doubtful that a septic filter alone is going to rescue a failing septic absorption field. The septic or gaywater filter may added ahead of the septic tank or drywell or in a different design a septic effluent filter is added at the septic tank outlet to protect the drainfield. Such filters require periodic maintenance (cleaning) to avoid a sewage backjup. See FILTERS SEPTIC & GREYWATER. See SEPTIC BACKUP PREVENTION for a more complete set of advice on how to avoid a septic problem during times of anticipated heavy septic system usage. You might also enjoy TEN STEPS to Keeping a Septic System Working. People really do fall into septic tanks, cesspools, drywells, usually with fatal results. The requirement to assure safe covers on septic tanks and similar equipment are important. See this list of septic tank fatalities and other accidents SEPTIC TANK ACCIDENT REPORTS. Continue reading at SEPTIC TANK OBJECTIVE DATA or select a topic from closely-related articles below, or see our complete INDEX to RELATED ARTICLES below. Or see SEPTIC TANK PUMPOUT MISTAKE FAQs - questions & answers posted originally at this article. If you don't know where the septic tank is located, see SEPTIC TANK, HOW TO FIND. 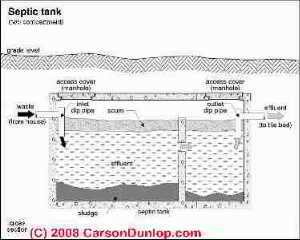 At TANK INSPECTION PROCEDURE we describe how to inspect the septic tank before, during, and after tank cleaning operations. SEPTIC TANK PUMPING MISTAKES at InspectApedia.com - online encyclopedia of building & environmental inspection, testing, diagnosis, repair, & problem prevention advice.